This pedal aimed at creating classic rock and roll bass tones from the ’70s through the ’90s. Special Design featuring Hybrid JFET and CMOS gain stages for a natural dynamic response CMOS Bass Overdrive. 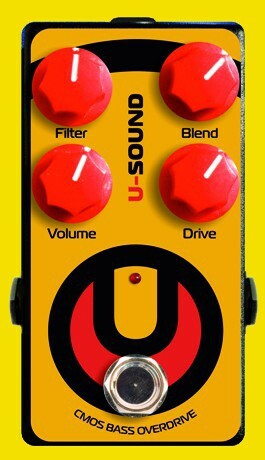 We hope that this pedal will satisfy the musical tastes of many bass guitarists playing music of various styles. The sound of this pedal, its dynamics are close to the tube sound. Like most bass overdrive pedals, this stompbox present adjustment "Drive", "Blend" and "Volume". Besides, there is adjustment "Filter", which differs from most standard tone adjustments. Set the "Filter" to the minimum - and you get a soft tone with exaggerated "middle", with handles povrotom "Filter" in the sound there is a big readability and aggression. By varying the value of knob "Filter" with the other knobs, you can get your sound in a very wide range of possibilities. Like all pedals U-Sound, this pedal is True Bypass. Drive- sets the ammount of gain. Blend - Mix of clean sound and overdrive. Volume - overdrive output level. Filter - special Tone section. "CMOS Bass Overdrive" will ship within 3-4 business days of receiving cleared payment.